Everybody wants the latest iPhone. While Superman collects Parademons from that first invasion from Apokolips (seen in the show), one of them drops a Mother Box, and it falls into the hands of a small-time thug. The power goes to his head as he takes over the gang, then opts to show his real power. Superman tricks him into opening a boom tube to Apokolips where he learns that he isn’t so important after all and has to leave the Mother Box behind for his own safety. Superman turns him in to the SCU. What they got right: What would an ordinary bad guy tired of being mistreated by his own gang do with a Mother Box? That’s the story explored here and it’s a really interesting one. There’s a nice parallel with his old boss taking his gun and the Parademon taking the Mother Box. It’s a good story, and the art team (not surprising given the penciler) replicates the art style quite well. What they got wrong: Parademons don’t talk. I don’t remember them taking in the DCAU and even the main universe Mike from Total Justice talking was a surprise. And why didn’t the Parademons go after Superman as well as the thug? Were they in on the moral lesson of the story? 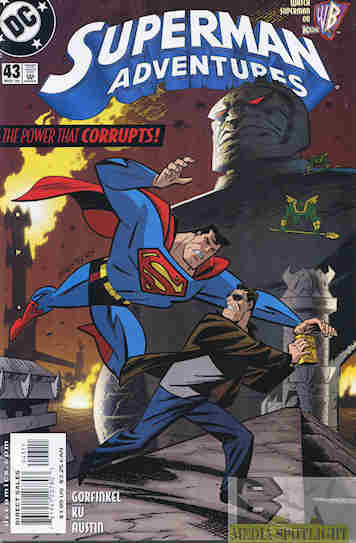 Recommendation: A good Superman DCAU story worth checking out. Posted by ShadowWing Tronix on February 9, 2019 in Animation Spotlight, DC Spotlight, Television Spotlight, Yesterday's Comics and tagged DC animated universe, DCAU, Mother Box, Superman.